This recipe is traditionally made with “Khoya” (Khoya is a common dairy ingredient in many traditional Indian sweets, and sometimes even in some spicy dishes). Ricotta cheese is a good substitute for Khoya. If you want you can buy Khoya from an Indian store. This is a simple sugar syrup. It is best to make it before starting to make the Gulabjam dough balls. Keep the sugar syrup warm. To make the hot sugar syrup, place the sugar and water in a saucepan. Add 4-5 cardamom pods (or cardamom powder), slightly crushed, rose essence (if using) and a few strands of saffron strands, mix well and cook on medium heat for 5-10 minutes until all the sugar is dissolved in water. Do not overheat otherwise it will caramelize. Transfer the hot syrup into a serving dish. Add the fried Gulabjam balls directly into the warm syrup. Leave them in sugar syrup overnight for best results. They can be served warm or at room temperature or even chilled with syrup. Place the ricotta cheese (or Khoya, if using) in a nonstick pan, add the 1 tsp. Ghee and heat it. Stir constantly. After 25-30 minutes, mixture starts leaving the bottom of pan. Now remove from heat and let cool. Mix the all-purpose flour with the ricotta cheese and knead well to make a soft dough. You may add a little milk to help you knead the dough. Make small round balls (golf ball size or smaller) out of the dough. Cover balls of dough with a damp towel. In a deep frying pan, heat vegetable oil, shortening (or ghee, if using) over moderate heat until it is hot but not smoking. Deep fry Gulabjams over low heat. Keep stirring around them in the frying pan until they change color evenly to a golden brown. Transfer Gulabjams into the hot sugar syrup. Once completely soaked in the syrup, chill. Serve Gulabjam chilled or hot, preferably hot. They taste heavenly after 1-2 days. Do not overheat the sugar syrup. Gulabjams do not soak up thick syrup. Syrup should be hot enough while transferring the Gulabjams into it. To keep from forming sugar crystals, sprinkle some water over the hot syrup. Sometimes, Gulabjams turn hard if chilled. If so, reheat them before serving. Enjoy the Taste of India! Makes 18 to 20 golf ball size (or smaller) Gulabjam balls. It tasted just like my grandma's dessert. Even though I haven't tried this recipe, I know that it will be good because it is one of my favorite desserts, and no matter which recipe you use, it always turns out perfectly yummy! 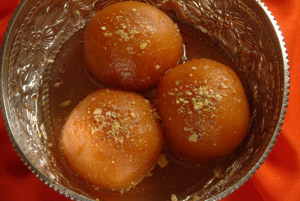 Its not GULABJAM, its called GULABJAMUN!